THAT’S THE WHEY® - the highest quality whey protein. 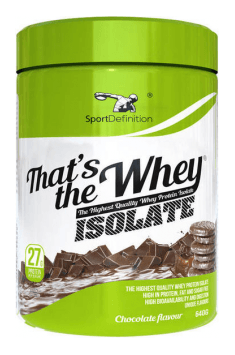 That’s the Whey® Isolate provides working muscles with optimal nutritional value during the periods of high requirement for protein. Because protein contributes to the growth and maintenance of the muscle mass and contributes to the maintenace of noraml bones is specially recommended for strength and endurance sports individuals. Product is easy to prepare and use due to the instant formula. One portion (30 g = one measurement scoop) 2-3 times a day depending on the needs. In comparison to whey protein concentrate (WPC), whey protein isolate (WPI) has a higher protein content and trace amounts of fat and lactose. Thanks to this, it works perfectly even in case of most restrictive diets and helps to follow dietary regimes. It may be assumed that the daily dose of protein in the diet of sportsmen and physically active people would range from 1,5 to 2,2 g/kg of bodyweight. If you do not cover your needs for this macronutrient, you may take it in the form of capsules at the amount corresponding to the deficits. It is worth taking in the morning after waking up, after training, before sleep and during longest breaks between meals. Sports Definition it is our vision of sport and sports supplementation. In our work we use the latest achievements of science and technology. This ensures that our products are perfectly balanced in terms of nutritional value. Each product has the necessary certifications and approvals, so we are sure that the product that we provide is of the highest quality.